In order to create a PDF from one of your dashboards, you first need to create a report. You create a report by clicking "Create Report" in the upper right corner of the specific dashboard view. Before clicking this button, just make sure that you display data up until the date that you want to report on. You find the "Date range selector" under the dashboard's title. 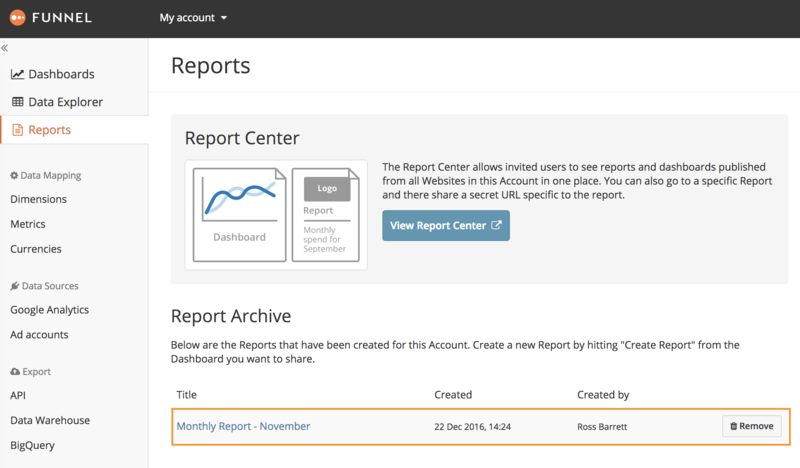 The report that you create will then end up under the "Reports" section in Funnel and in the "Report Center". From the "Reports" section or the "Report Center" you now simply choose the report that you want to make into a PDF and then click the button "Save PDF" in the upper right corner. That's it! The PDF should now be downloaded to your computer.